The Pro+ Aero jersey's blend of traditional race fit and modern aero still make it one of our most popular pieces. The main body panels are made of lightweight Coolmax fabric to keep you dry while the sleeves use a lycra to give a more aerodynamic fit. The standard collar give a more traditional look than the Pro Aero II. The Pro+ Aero is available in both men's and women's race fit from XXS-3XL. Scottie Weiss isn't just a champion graphic designer, he's also a World Masters champion. The lycra sleeves give a great pallet for his stripes. 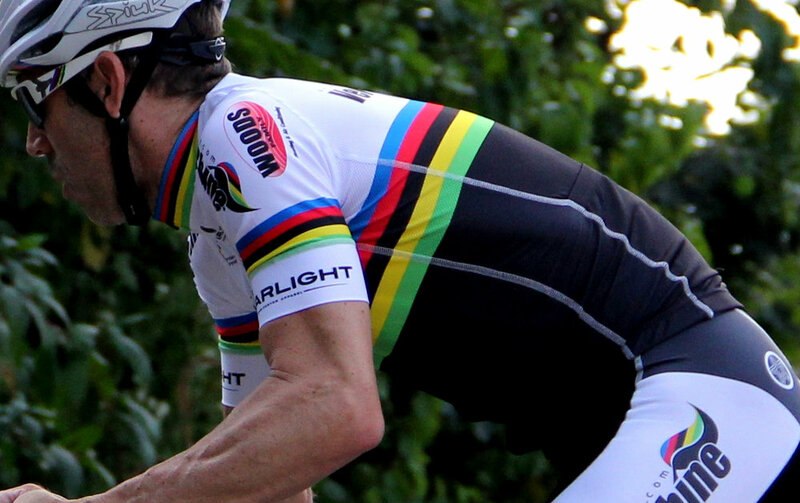 Most custom cycling apparel brands won't line up patterns over seams. You can see here with Scottie's World Champion stripes that it's no problem for us. Folded lycra sleeve cuff, connected to the sleeve with flatlock stitch in your choice of thread color. Lycra mesh side panels help the jersey vent as well as allow a snug fit without constriction.